← Local Food Challenge 2012! With my window fan having been firmly in the off position for four nights in a row I think it’s safe to say my favorite season has hit. To me Autumn has always seemed like more of a time for change and renewal than Spring – summer’s fun has come to an end and the gentle slide into my second favorite season (hello, Christmas!) begins. The school buses, breaking out sweaters and loafers, getting back into some sort of routine…all good things. Speaking of a routine, I had been missing my Saturday morning visits to the local greenmarket. So last weekend, coffee in hand, I took a good long stroll through the farmers market. Taking in all the beautiful produce a little voice inside my head began to chant “soup…soup…soup…SOUP!” I had no choice but to give in. How could I not when everything looked so darn good and soup is so darn comforting!? September truly is such a fantastic time at the market – the place is overflowing with nature’s colorful bounty (and in my neighborhood – adorable dogs and double wide strollers). Just look at all this! This hearty, tomato based vegetable soup is just the thing for using up all that beautiful (local) produce you pick up this weekend. Stick to using strictly the veg on my ingredient list or vary it to suit your tastes! I admidt I strayed just a touch from being strictly locavore – I added dried herbs and olive oil to the soup…I do hope you’ll forgive me. Preheat oven to 400 degrees. Quarter the tomatoes and onions. Toss with salt, pepper, olive oil, 3-4 sprigs of thyme and the whole peeled garlic cloves. 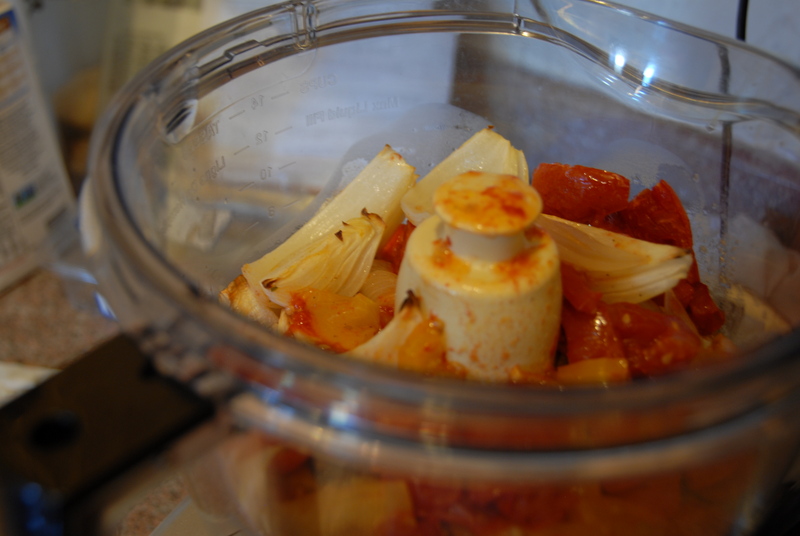 Roast until the tomatoes and onions are almost caramelized – about 30 minutes. Meanwhile cut corn off the cob using a sharp knife (doing this into a large bowl helps not to get kernels all over your counter!) and set aside. Cut the fingerling potatoes into about thirds (depending on the size of the little guys) – reserve in cold water. Cut the leek and carrot into a very small dice. Place the mixture into a big soup pot with a T of olive oil and butter. 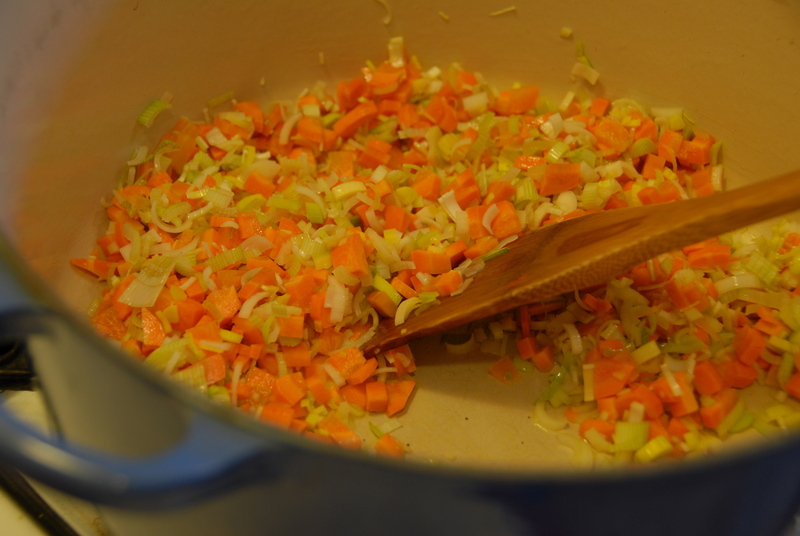 Over low heat sweat the leek and carrot mixture – cook until soft and fragrant but not brown. Stir often. After about 10 minutes add salt, this will aid in the process. You want to build layers of delicious vegetable flavor – this low and slow cooking of the leek and carrot will really help! Once the leeks are translucent and the carrots are soft add the corn and potatoes stirring to combine. Season well with salt and pepper. Cook for about 8-10 minutes longer. 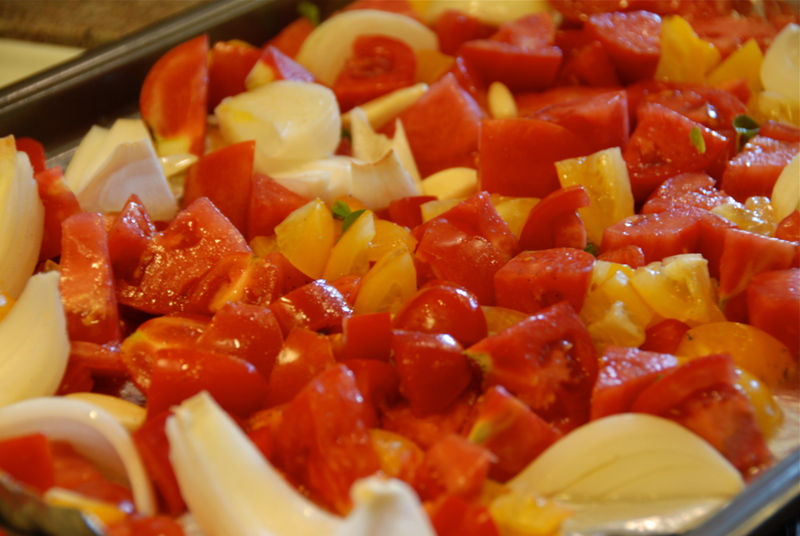 Once the tomatoes and onions are finished roasting remove the sprigs of thyme and process the rest in a food processor until smooth. 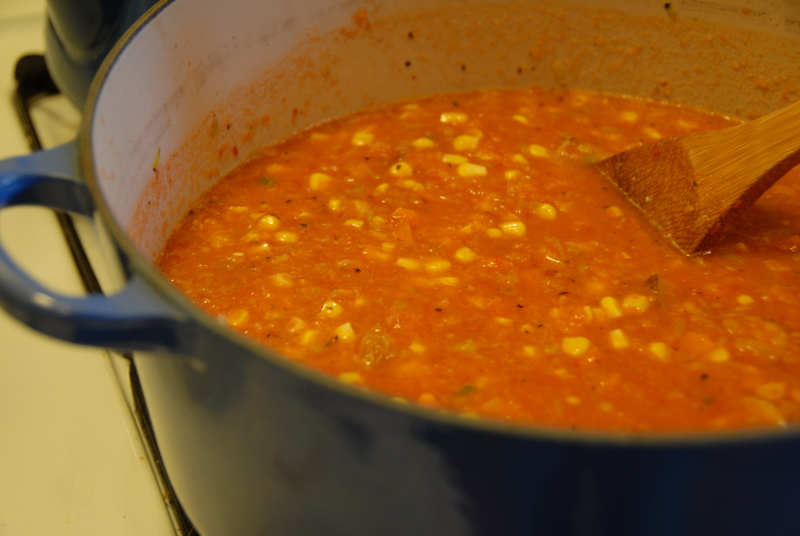 Add the tomato mixture to the soup pot along with 2-3 cups of water (depending on how thick the puree is). Stir well and season with oregano, basil, red pepper flake, S&P. Simmer on low for 20-25 minutes. Check for seasoning and adjust to your taste. This deliciously hearty soup gets amazing depth of flavor from the roasted tomatoes. It’s wonderful with a drizzle of good quality olive oil on top or a dab of the local creamery’s tangy goat cheese. It’s the kind of food my Mom would say “sticks to your ribs” – just what you need on a brisk fall day. 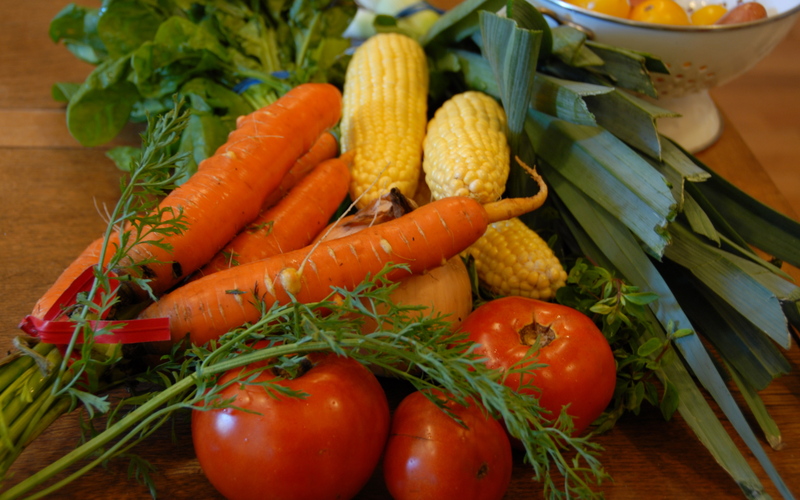 This entry was posted in Basil, Carrots, Corn, Farmers Market Finds, Garlic, Local Food, Onions, Thyme, Tomatoes and tagged corn, fall, farmers market, hearty, heirloom tomatoes, local, potatoes, soup, tomato. Bookmark the permalink.